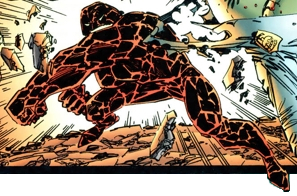 Volcanic was part of the death squad that OverLord assembled to eliminate CyberFace when he had been arrested by the Chicago Police Department. She and her companions were all arrested by Dragon and his allies and sent to Stronghold Penitentiary. Volcanic remained incarcerated until shrunken Vicious Circle members liberated her and other villains. Volcanic later defeated an inexperienced She-Dragon in battle but after the heroine had undergone some training, Volcanic was defeated alongside a number of her allies, demonstrating just how far She-Dragon had come. Years later, CyberFace ruled over the Earth and a faction of the Vicious Circle was abandoned in Chicago. Volcanic was part of this group and took part in Dragon’s rebellion that attacked the White House. After CyberFace was deposed, all of Dragon’s criminal allies were rounded up and locked away. Volcanic later escaped during another breakout and returned to active duty with the Vicious Circle.